Three years after Sri Lanka’s brutal civil war ended, both sides are still feeling the repercussions. Nate Barker reports on the British government’s hypocrisy in its policy towards the country. Recently, the media has been reporting that Sri Lankan deportees from the UK are at risk of arrest and torture by the authorities for alleged ‘terrorism’ links. While it’s no secret that the Liberation Tigers of Tamil Eelam (LTTE, also known as the Tamil Tigers) received support and funding from the Tamil diaspora during the long civil war, many Tamils deplored violence on both sides with equal measure. Now, the UK has been happy to resume deportations claiming that with the war’s end, the security situation is now improved. The UK used similar logic in 2005 regarding Iraqi citizens, claiming the removal of Saddam Hussein had made that country safer. Both the UK and Sri Lanka strenuously deny that returnees are in any danger of mistreatment, despite evidence to the contrary. A planned deportation in June this year was dramatically halted as the plane was on the runway based on the deportees’ risk of mistreatment. But some deportees have already been sent once to Sri Lanka, only to return to the UK and be granted asylum the second time round due to being tortured by the authorities. This decline in respect for human rights in Sri Lanka is symptomatic of a country slipping into authoritarianism. As the conflict worsened post-2006 and the government began pursuing a military solution, their forces came under increasing criticism for their brutal approach, leading to human rights investigators officially pulling out of the country citing lack of governmental cooperation. At the time, Human Rights Watch called the Sri Lankan government ‘one of the world’s worst perpetrators of enforced disappearances’. 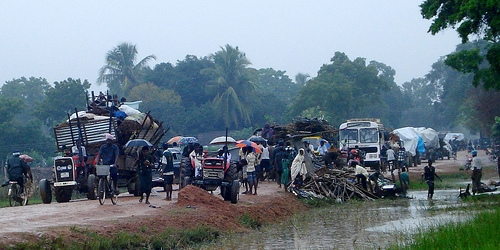 The final stages of the war in 2009 saw civilians trapped between the two armies, used by the LTTE as human shields, while the Sri Lankan Army freely admitted to bombing designated civilian safe areas as the war ended. Having comprehensively defeated the LTTE, President Rajapaksa next turned on his domestic enemies. His close ally, General Fonseka, one of the key figures in the government’s assault on the Tamil strongholds (and himself accused of overseeing human rights violations during the war), fell out with Rajapaksa and stood against him for the presidency in 2010. He was violently seized and arrested shortly after the elections, accused of plotting a coup and planning to assassinate the President and his family. He was only released from prison this May, having been pardoned by Rajapaksa. In fact, the UK Foreign and Commonwealth Office’s latest report on human rights in Sri Lanka talks about an increase in abductions and disappearances and the violent suppression of protests. These are all signs of a government increasingly intolerant of any dissent. Meanwhile, given that the LTTE had been effectively and peacefully governing the north of the island for decades, it’s not hard to paint the majority of northerners as potential sympathisers. These ‘terrorist links’ can then be extended to any relatives abroad, thus providing justification for targeting them as well. Sri Lankan officials are also immediately suspicious of anybody with links to London; as a large centre of Tamils and an important source of support for the LTTE, deportees from here have always been particularly suspect in the eyes of the Sri Lankan government. It’s known, for example, that the London embassy has frequently sent officials to photograph protests; evidence that is now being used against deportees when they are returned home. So we should ask why we have one branch of the British government condemning the Sri Lankan government for its use of torture, while another claiming that Tamil deportees do not risk being tortured. Although the FCO claims that ‘human rights are essential to and indivisible from the UK’s foreign policy priorities’, the UK Border Agency is pursuing a hard-line stance on immigration, and it appears for now that this has won out over our human rights obligations. This government is doing the right thing in pressuring Sri Lanka on its human rights obligations, but it needs to follow this up with action at home, and show its commitment to protecting those that have come to our country by halting all deportations until further notice. War is over and there is peace for now. But at the expense of so many (and civilian too) lives. No more civil war, now the country maybe resurrect itself, once a strong economy and still having good literacy rate and health care in south asia. But does the end justify the means? My questions are unrelated, but reading about sri lankan conflict, these things i do wonder. And unless a good bargain from foreign stake holders like UK, yes the deportees are very likely to be condemned wrongly..